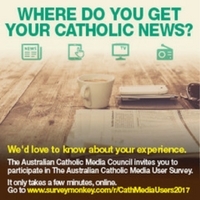 The Australian Catholic Media User Survey, which closes on November 30, will help inform the Commission about how and where people get their Catholic news and information. “If you regularly or semi-regularly consume Catholic media, whether that be traditional newspapers, magazines or web-based publications and social media platforms, then the Australian Catholic Media Council wants to hear from you,” said Council Chair, Debra Vermeer. “Do you find that it helps to educate, form, challenge and deepen your faith, connect you to the local Church or to the universal Church? What is the particular character and role of Catholic media in Australia in 2017 and what might you hope it will be in the future? How can we strengthen Catholic media Australia? To access the survey, click here: https://www.surveymonkey.com/r/CathMediaUsers2017.